Update April 9 2:30 p.m. — The Grand Canyon National Park trail crews were able to open the bridge between Pipe Creek and Silver Bridge to foot traffic only. The Redwall Bridge remains closed from 8 a.m. to 4:30 p.m. daily. Access to Ribbon Falls is closed. GRAND CANYON, Ariz – Rim-to-rim travel in Grand Canyon National Park will be restricted as the park begins daily closures of the North Kaibab Trail at Redwall Bridge to remove debris from a storm-caused rock slide. The rock slide damaged a portion of the North Rim water supply line that runs close to the trail. Before Grand Canyon water utility crews can repair the pipeline, they must clear and stabilize the remaining rock and debris above the pipeline and trail. The damaged water line does not affect South Rim or Phantom Ranch operations. 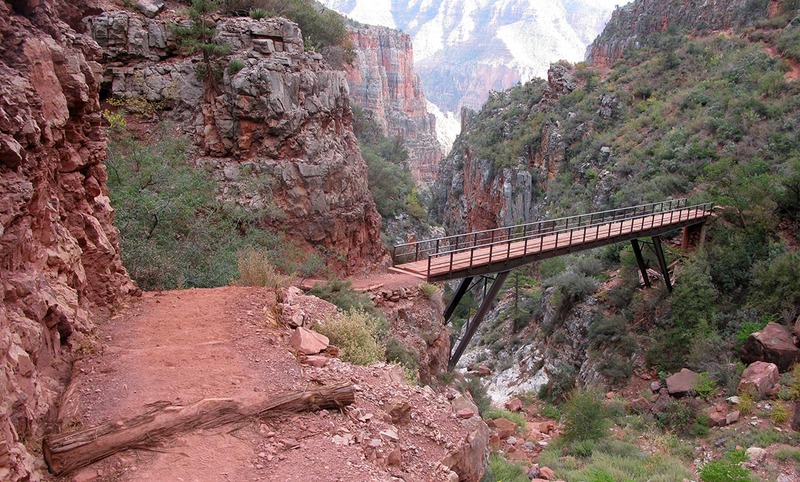 To ensure visitor and crew safety during the stabilization process, the National Park Service will close the North Kaibab Trail at the Redwall Bridge to all trail users from 8 am to 4:30 pm daily while crews are working. The Redwall Bridge is located about 2.5 miles above Manzanita Rest Area, four miles above Cottonwood Campground, and one mile below Supai Tunnel on the North Kaibab Trail. The closure order is in effect until crews determine the area is safe to access. The estimated time of trail closure is three weeks, but that could change depending on weather and resources. Cottonwood Campground on the North Kaibab Trail will remain open and accessible, as will Phantom Ranch, Bright Angel Campground, and the South Kaibab and Bright Angel trails. Hikers and backpackers are advised to plan ahead and check in a visitor center or the backcountry office for updates. Access to Ribbon Falls is also closed at this time. The bridge that crosses Bright Angel Creek sustained damage making it impassable to foot traffic. There is no estimated time of repair for the bridge, it will remain closed until further notice. For updated information about the North Kaibab Trail and Ribbon Falls closures, please check the park website or call 928-638-7888.